Recent losses of personal data held on discs, laptops and USB keys by governments and companies have highlighted the need for better security. Here Dan Simmons looks to see if biometrics can help. As the name implies biometrics is all about using a measurable biological characteristic, such as a fingerprint or iris pattern, to identify an individual. And the field is not confined to gross physical characteristics such as facial features, more subtle measures - such as the way a person walks - can also be used to identify individuals. Researchers at the University of Southampton have won funding from UK and US governments to establish this form of biometrics. They claim their gait recognition system is 99% accurate when identifying people. "From a picture, we take the human body silhouette, and we get a set of measurements which describe the subject's shape," said Prof Mark Nixon, head of the gait research group at Southampton. "We also get a set of measurements which describe the movement, and together, those are used to recognise the person. "The alternative to that is to use a model, and so we model the movement of parts of the body like the thorax and limbs. The motion of the model gives us the set of numbers that we then use to recognise you," he said. To collect data the team has designed a tunnel employing eight cameras that feeds data to sophisticated modelling software that collects data. Through this work, researchers have been able to analyse variables in the real world, such as different surfaces and shoes, and how these might affect the way people walk. 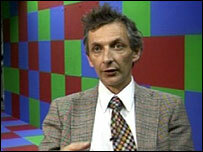 Prof Nixon's database currently stands at 100 students, but the technology is already being used outside the labs too. 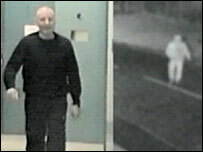 Automatic gait recognition on public CCTV images has been admitted as evidence in UK courts for the first time. One man was convicted of a burglary after podiatrists compared CCTV images of him on his way to commit a crime with images of him in custody. The CCTV pictures were grainy and made identification difficult, but the 35-year-old's distinctive swagger gave him away to experts. Prof Nixon hopes to automate this type of video matching, but recognised that walking styles can be affected - or not work at all if the person is covered up or trying to hide their usual walking style. But, he said, some elements of an individual's movement did not change and the advanced modelling his group uses could factor out problems. 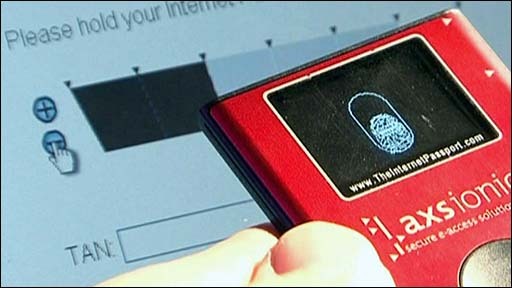 As the pen and signature are slowly replaced by the computer and keyboard, security companies are now offering software that recognises a user by the way they log into a computer. The tech measures the time between keystrokes, how long each key is held down, and total time taken to do tasks. Some companies have turned to typing recognition to stop staff sharing passwords. A less tested form of biometrics is odour recognition, which is being studied to see if sensors can tell people apart by the way they smell. Apparently, not even a strong curry can hide personal odour, but the tech required is expensive and has not been tested outside the labs. 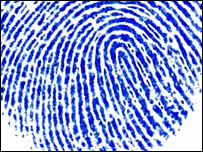 Despite these advances, the physical biometric in widest use is the fingerprint. Fingerprint readers have been built into laptops, and some banks are looking at using these devices to secure cash machines and online banking. Tech giant Siemens has developed what it calls an "Internet Passport" that presents users with a flashing barcode when they visit a bank or shopping site. 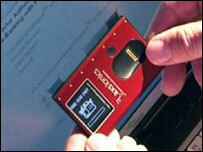 A device held up to the computer screen read the information encrypted in the flashing image and deciphers it. Users then swipe a finger on the device, and after verification, are shown a decoded string of numbers needed to access the website. Jonathan Haywood, from Siemens, says the company is in talks with a couple of banks in the UK, Germany and Switzerland. "The device stores 128 possible accounts, you can then use this substitute all of your credit cards, or store cards, you can use it for loyalty schemes," said Mr Haywood. "So you don't have to have a big wallet full of things, you can have just this, and it will handle all of the security for you." The company believes this device will stop fraud, but it involves the user doing more of the work, and costs US$100 (£61) a unit.